1lb per minute. Continuous grinding system means no loading/downtime on the machine. Features 3 sizes of adjustable screens, so you can control the particle-size of your grind and safely hand over the grinding process to anyone on your team! Grinder is made of stainless steel with easily removable parts for cleaning and soaking. 1 Year Warranty Standard. Please see additional details in FAQ. Stop blending or shredding your flower into dust! Our Industrial Grinder was built with pre-rolls in mind. With three screen sizes and multiple blade options, you can now grind your flower to the perfect consistency. Our Industrial Grinder comes with 3 different screen sizes, which allows you to control the particle size of your flower. Maybe you want a blend of particle-sizes to create the perfect pre-roll or perhaps certain strains require a different screen size - the flexibility of our grinder is unmatched. 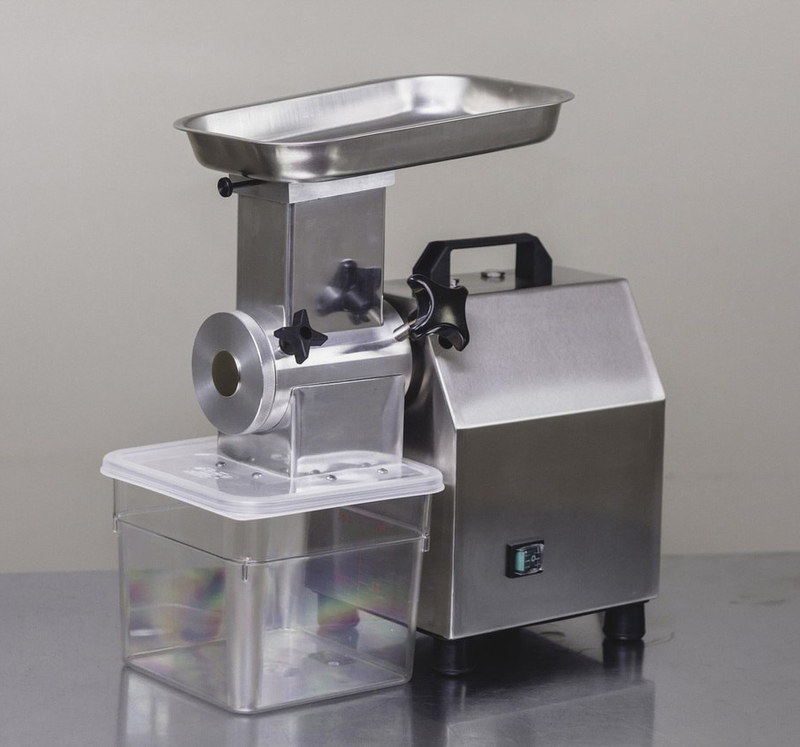 The Industrial Grinder features stainless steel blades, which are manufactured to reduce residue buildup on the blades. The blades are removable for easy access cleaning, so you never need to worry about excessive downtime for cleaning the machine. Stop turning your flower to dust and start grinding flower to the perfect size with perfect ease! Our Industrial Grinder comes with adjustable screens sizes and is fully customizable, so you can create the perfect grind for your flower. Some strains are more dense than others, so the adjustable screens and blade configurations allow you to get the perfect grind every time - no more turning your flower into dust! The high-torque and low RPM design helps to preserve terpenes and trichomes in the flower material by reducing the amount of heat and stress applied to the the flower material. The blades of our grinder move much slower compared to a high-rpm grinder like a blender or one of the weed-whacker style grinders with the plastic whips but still has enough torque to grind dense buds with ease. Made out of stainless steel and all food-grade materials, our Industrial Grinder is built like a tank. The stainless steel blades are removable and easy to clean. The entire unit can be taken apart quickly and cleaned with alcohol. Each grinder comes with a 1-Year Warranty and all parts are replaceable. + Why is this industrial grinder better than using a blender or weed-whacker style shredder? Our grinder is better than using a blender or weed-whacker style shredder for 2 key reason. The first is the high-torque and low-RPM motor. Using grinders with high RPM motors like a blender or a weed whacker style grinder generates a lot of unneeded heat and sheer force. The blades whip around at an extremely high-speed and on a microscopic level it is generating intense heat. This is destroying terpenes and trichomes. Our industrial grinder uses a low-RPM motor so the blades turn at a slower rate - this reduces the amount of heat generated. However the motor although it is low-RPM, it is high-torque which means it generates enough force to cruise through even the most dense buds. + How does this industrial grinder control the particle size of the final material? The industrial grinder has interchangeable screens allowing the user to control the particle size they would like. The machine comes with three screen sizes (S/M/L) to help you control your final particle size. The grinder also allows you to detach 2 out of the four blades - this allows you to further control the particle size generated from the grinder. + How does this industrial grinder help me increase pre-roll production? The industrial grinder can increase the number of pre-rolls you can manufacture in a single shift. Since you are able to accurately control the particle size of you pre-roll material you can precisely fill your pre-rolled cones to an exact weight. If your particle size changes from grind to grind it is close to impossible to accurately fill pre-rolled cones through volumetric weighing. When you use our industrial grinder in combination with industrial cone packer you can get every strain to fill your pre-rolled cones with stunning accuracy. It is the combination of being able to control your particle size and control the volume of cannabis you meter which will totally change the efficiency of your pre-roll production line. + Does the industrial grinder sift out stems? The industrial grinder does not sift out stems. What many customers do is first coarse grind the flower material and use a sifting screen to remove any stems. Then they take their stem-free flower material and do a fine-grind with one of the smaller screens included with the grinder. + What does the standard warranty cover on the industrial grinder? What does the pro warranty cover on the industrial grinder? The standard warranty is a 1 year limited warranty which covers damages except in the case of user negligence. The pro-warranty is a 5 year warranty which covers damages except in the case of user negligence, further, . User negligence includes gouges/scratches in the blades due to running rocks or metal through the grinder or negligence in regularly cleaning the unit. + Are there larger containers for the industrial grinder? Yes, we sell a barrel-chute attachment for the grinder which allows you to directly grind into a 5 gallon bucket or 55 gallon drum. Don't waste time changing containers and just keep on grinding! + Can I purchase replacement parts for the industrial grinder? Yes we sell replacement blades, replacement containers, replacement caps, replacement motors, and replacement grinder pieces. © 2019 Custom Cones USA.